Adjustable breathable nylon braided tactical belt, comfortable to wear, perfect for many outdoor occasions such as hunting, camping, training, mountaineering, farming, etc. High-quality nylon braided belt, breathable, durable and abrasion-resistant. Ergonomic zinc alloy buckle, anti corrosion and reduce friction to the belt. Fastener tape designed, attach the belt tightly, convenient to tie and untie, avoid abrasion. 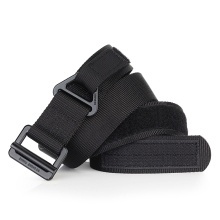 With no pin and belt holes, fastener tape adjusts the length freely, fit for different waist. Textured anti-slip belt, not easy to loose, suitable for all kinds of outdoor activities such as camping, mountaineering, climbing, hunting and training.